These kits are designed and packaged to meet the needs of your work site, are available in 10, 16, 24 and 36 unit sizes and meet the latest ANSI standards (ANSI Z308.1-2009). 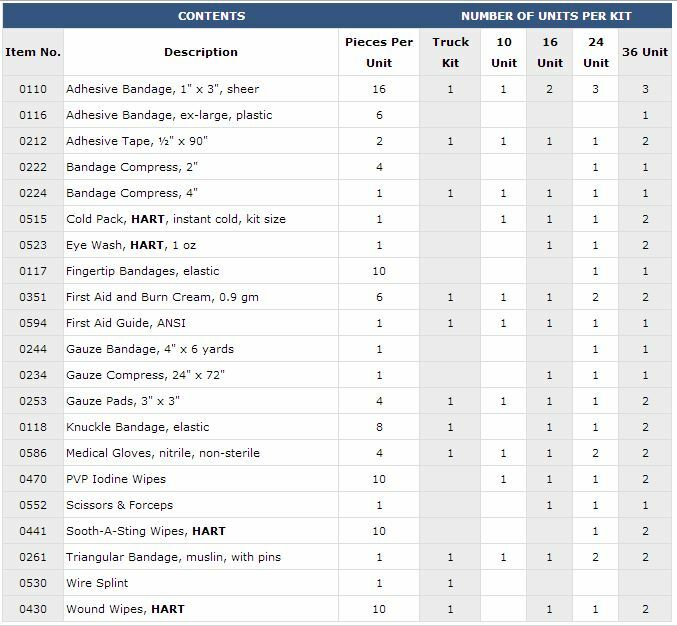 Containing the highest quality fills, HART kits offer exceptional value. Each unitized item is packed in a color-coded box for easy recognition and use, and contains an item number for quick restocking. Individual cellophane-sealed packaging helps keep supplies clean and organized. HART has carefully selected our Unitized First Aid Kit boxes for their ruggedness, durability, and weather resistance. Hinges, latches, handles and finishes are all of exceptional quality. All kit boxes have weatherproof gasket seals to assure you have clean, moisture-free first aid supplies. Each kit is designed to serve the number of people listed below.